There's a new home and garden show at Cleveland's IX Center February 6-14 --The Great Big Home & Garden Expo--and its line-up of attractions, hundreds of exhibitors, and great products and promotions, makes it distinctly different than any home and garden show Northeast Ohioans have seen before, and a must?attend for anyone looking for their next big home project idea. 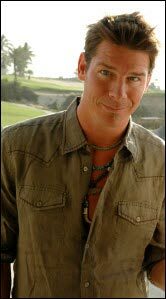 One of the stand-out highlights of the expo is a rare appearance by spokesperson Ty Pennington on February 13, sponsored by WEWS Channel 5 and Cleveland Magazine. Attendees will also be able to see his exclusive products and own designs in the Ty Style space. Christopher Lowell, host of the FLN interior design series Work that Room on February 6, sponsored by Jo-Ann Fabric and Craft Stores; and international designer and new products expert, Jean-Michel Gauvreau on February 6 and 7. Emceed by Christopher Axelrod, the Celebrity Stage will be an energetic and entertaining destination each day of the expo. This is Solon-based Marketplace Events' first show in the Cleveland market and replaces the previous Cleveland Home & Garden Show at the IX Center, which was produced by Expositions Inc. of Cleveland. Sue Huff, show manager, said, "People are not going to believe the quality and quantity of exhibitors at this expo. We worked hard to find the best products that we knew people in this market would be seeking for their homes and gardens. Combined with everything else that is happening at the show in terms of celebrity appearances, promotions, and more, this will be an event to remember," she added. The latest show information will be posted on www.greatbighomeandgardenexpo.com and on The Great Big Home & Garden Expo Facebook fan page. The Expo also has a presence on Twitter as GreatBigShow. The show will feature a plant sale at 7 p.m. on February 14, at the close of the show. Win Great Big Home & Garden Expo Tickets! Browse Valentine Gifts for Him, Her and You!